In this traininig video Coach Boone show the flow of the offense along with the many scoring options and entries that can be used with the 4-on-0 and 5-on-0 practice segments. Coach Boone explains the player movements needed to reverse the ball and the different ways the post can be fed through this action. Using 5-on-0, players run their secondary break options in transition, including getting a quick initial post feed or high/low pass and freeing up a shooter with a stagger screen. Coach Boone also works on flowing from their 'Two Game' offense into their 'Fist' ball screen actions. apariciones en 2 Final 4. En este video de entrenamiento, el Entrenador Boone muestra el flujo del ataque junto con las muchas opciones de conversión y las entradas que se pueden usar con los segmentos de práctica 4-en-0 y 5-en-0. El entrenador Boone explica los movimientos del jugador necesarios para revertir el balón y las diferentes formas en que se puede alimentar el poste a través de esta acción. Usando 5-en-0, los jugadores ejecutan sus opciones de la corriente secundaria en la transición, que incluyen obtener un pase inicial rápido al poste o un pase alto / bajo (high-low) y liberar un lanzador con una pantalla escalonada. El Entrenador Boone también trabaja en pasar de su 'Ataque de Dos' a sus acciones 'Puño (Fist)' de pantalla sobre el balón. Drills to Build Your Offensive Imagination TRAINING VIDEO by Bob McKillop! Ejercicios para Construir su Imaginación Ofensiva! VÍDEO de ENTRENAMIENTO ~ Bob McKillop! TRAINING VIDEO by Bob McKillop! 2008 NABC Coach of the Year; over 400 career wins. In this training video Coach Bob McKillop details how to teach your players to attack space, find the open man, catch and see the floor, dribble with a purpose, and finish the cut in order to make your half-court offense unstoppable. Coach McKillop uses on-court demonstrations to teach five drills that instill these concepts, yet keeps your offensive game simple. These drills will help players become better decision-makers on the court. Drills to Build Your Offensive Imagination! Ejercicios para Construir su Imaginación Ofensiva! VÍDEO DE ENTRENAMIENTO por Bob McKillop! Entrenador Principal Baloncesto Masculino de EE. UU. Más de 400 victorias en su carrera. En este video de entrenamiento, el Entrenador Bob McKillop detalla cómo enseñar a sus jugadores a atacar el espacio, encontrar al hombre abierto, atrapar y ver el campo, driblar con un propósito y terminar el corte para hacer imparable su ofensiva de medio campo. El Entrenador McKillop usa demostraciones en la cancha para enseñar cinco ejercicios que inculcan estos conceptos, pero mantiene su juego ofensivo simple. Estos ejercicios ayudarán a los jugadores a ser mejores tomadores de decisiones en la cancha. former Garrard County (KY) High School Head Coach! Lee Deforest is a brilliant tactician that has coached the Princeton offense at every level, from high school to Division 1. Coach Deforest breaks the Princeton concepts into reads and counters. He defines reads as being player-controlled and counters as being coach-controlled. Utilizing this conceptualization, DeForest provides detailed diagrams on a whiteboard and then illustrates these concepts on the court with his team in a 5 on 0 setting. You'll get detailed breakdowns of reads within the offense, counters to defensive strategies, set plays to help you score quickly, and more. From today's sets including Horns, Spread Offense and Sixers, to old school Princeton sets such as Chin, Circle and Point, you'll learn something new that is easy to teach and easy for your players to pick up. Coach DeForest offers a variety of concepts that any coach can utilize to fit the Princeton offense to their personnel and system. Coach DeForest goes beyond simply expanding upon these primary sets to the Princeton offense. He includes six additional plays that will help you enter into the offense, provide scoring looks unique from other options in the Princeton offense, and score through a secondary break in transition. Horns and Sixers are entry plays taken straight from the NBA that can provide some quick hitting options before flowing into the Point series. Lumberjack alters the screening and cutting action of the Chin series before transitioning into an isolated two-man game off the elbow that can allow your players to operate with space. Coach DeForest's mastery of using diagrams and on-court demonstrators make this training video the perfect set for any coach that is looking to install the Princeton offense. From the basic alignment to today's hottest NBA Entries, this is a must-have for your collection. "... As a coach I have worked at the Division I, NCAA D2, Junior College levels, as well as a head coach at the high school level for 7 years at 4 different high schools. I had an overall winning record as a head coach, and we won a state championship when I was an assistant coach. My passion for basketball started with my father who was a head high school coach for many years after playing DI basketball for the HOFer McBrayer at EKU. My love for the game carried me to play NAIA and JUCO basketball before getting into basketball coaching as the head manager at EKU under Oklahoma State's Travis Ford. Currently, I own and operate BasketballInsight.com as well as serve as an assistant high school coach. ..."
Coach Gregg Marshall teaches his match-up zone with on-court demonstration and reinforces the points of emphasis with game footage. The defense keeps pressure on the basketball and discourages easy entry into the middle. The video includes drills to teach the defense and demonstration of the coverages. Coach Marshall designs his half-court match-up zone for easy combination and implementation with the 2-2-1 press. El Entrenador Gregg Marshall enseña su zona de emparejamiento con una demostración en la cancha y refuerza los puntos de énfasis con las imágenes del juego. La defensa mantiene la presión sobre el balón y desalienta la entrada fácil al medio. El video incluye ejercicios para enseñar la defensa y demostración de las coberturas. El entrenador Marshall diseña su zona de enfrentamiento de media cancha para una fácil combinación e implementación con la presión 2-2-1. • Learn how to teach players to make better decisions in disadvantage situations using drills created by one of the country's top high school coaches. Legendary California high school coach Frank Allocco shares practice secrets like disadvantage drills that will help your team crush opponents. These drills prepare players by putting them in practice situations that are tougher than anything they'll encounter in a game. Usando demostraciones en la cancha, el Entrenador Allocco muestra cómo usar ejercicios básicos en una situación de desventaja. Sus ejercicios de dribble enseñan a los manejadores del balón a crear espacio y atacar cuando se les da la oportunidad. Con los ejercicios ofensivos de desventaja, los jugadores aprenden cómo manejar una doble marcación y cómo ser fuertes con el balón. El conjunto de desventajas defensivas cubre puntos clave como la competencia y la comunicación. Los ejercicios de ataque rápido también se utilizan para preparar a los jugadores para los escenarios del día del juego. Finalmente, en los ejercicios de desventaja de la cancha completa, los jugadores pueden correr arriba y abajo de la cancha usando muchos de los conceptos cubiertos en las secciones anteriores. Duke Basketball: Creating a Championship Post Player by Jeff Capel! Each move is taught on both sides of the paint and to develop the use of either hand. • 4 Around 1 Breakdown Drill - A breakdown of shots and situations your posts will see in your offense. • 4 and 5 Shot Drill - These drills string together a series of shots that posts will regularly see in games. • Wing (wide action) and Angle Ball Screens (high action) - Improves the effectiveness of the 2-man game. • 5 Spot Skills (out of rips and off of offensive rebounds) - Forces post players to develop skills from the perimeter, which can be an uncomfortable location for them on the court. With Duke's post player development, your post players will become unstoppable multi-skilled and mobile big men. Coach K, Steve Wojciechowski and Jeff Capel who revealed that he encourages recruits to look past all of those perceptions and actually watch game tape of the Blue Devils. El Entrenador Asistente del Duke, Jeff Capel ha creado una sesión de ejercicios para el jugador poste que está pleno de elementos que desarrollan la habilidad y la movilidad. Cada movimiento se enseña en ambos lados de la pintura y para desarrollar el uso de ambas manos. Basketball Training Video by Jason Papalio! Every season, coaches explore various techniques to help their players improve. Oftentimes, the focus is on skill-based techniques and many people overlook how to build their athletes' balance and athleticism within the game. In this training video, Jason Papalio shows us one of the ways to improve your athletes' athleticism on the court, utilizing various pieces of equipments such as rearrange harness and balance rings in order to build strength, power, balance and speed. Every off-season and in-season pre- or post-practice routines can be positively affected by implementing some of these training methods. Use a Resistance Band to Improve Basketball Player Balance! para Mejorar el Equilibrio del Jugador de Baloncesto! Cada temporada, los entrenadores exploran diversas técnicas para ayudar a sus jugadores a mejorar. A menudo, la atención se centra en las técnicas basadas en las habilidades y muchas personas pasan por alto cómo desarrollar el equilibrio y la capacidad atlética de sus jugadores dentro del juego. En este video de entrenamiento, Jason Papalio nos muestra una de las maneras de mejorar la capacidad atlética de sus jugadores en la cancha, utilizando varias piezas de equipos como el arnés y los anillos de equilibrio para construir fuerza, potencia, equilibrio y velocidad. Todas las rutinas previas o posteriores a la práctica fuera de temporada y durante la temporada pueden verse afectadas positivamente al implementar algunos de estos métodos de entrenamiento. Improving Players' Athleticism: Recovery Techniques by Jason Papalio! "Drag Improving Players' Athleticism: Recovery Techniques by Jason Papalio! After a game or hard practice, it might seem normal to immediately pack up and head to the locker room. However, what you're missing out on may be one of the most important components to your team's longevity over the course of a season. Athletic recovery training specialist Jason Papalio explains the importance of using recovery techniques in this training video. You'll learn why it's essential to warm-down to prevent injuries and ensure that your athletes can bounce back quickly for the next game or practice. Recovery Techniques for Basketball Players! Técnicas de Recuperación Atlética del Jugador por Jason Papalio! Después de un juego o práctica, puede parecer normal empacar inmediatamente y dirigirse al vestuario. Sin embargo, lo que se está perdiendo puede ser uno de los componentes más importantes para la longevidad de su equipo en el transcurso de una temporada. El especialista en entrenamiento de recuperación atlético Jason Papalio explica la importancia de usar técnicas de recuperación en este video de entrenamiento. Aprenderá por qué es esencial el trabajo de estiramiento y enfriamienmto para evitar lesiones y garantizar que sus atletas puedan recuperarse rápidamente para el próximo juego o práctica. 2015 College Basketball Invitational (CBI) Champions! Loyola was the second-best team in the nation at committing the fewest fouls per game, and was the leader in defensive efficiency for the entire country. Moser shares three critical areas to his team's help-oriented defensive system that will help you challenge shots at the rim.
. a breakdown drill with simple teaching points that your players will always remember.
. a teammate when the opponent drives to the rim.
. opponent's screening actions while minimizing the errors that will beat you. Porter Moser's Tactics to Get Basketball Players to Buy In! In this great on-court instructional training video Sean Miller teaches his sons how to develop better ball-handling skills. With two-ball dribbling drills the kids go through the same challenging workout that the Arizona Wildcat Guards go through. While difficult at first this workout will eventually help the younger ball-players become significantly better dribblers, especially with their weak hand. En este gran video de entrenamiento instructivo en la cancha, Sean Miller enseña a sus hijos cómo desarrollar mejores habilidades de manejo de la pelota. Con ejercicios de dribbling de dos bolas, los niños pasan por el mismo ejercicio desafiante que realizan los Arizona Wildcat Guards. Si bien al principio es difícil, este entrenamiento ayudará a los jugadores de pelota más jóvenes a convertirse en dribladores del balón significativamente mejores, especialmente con su mano débil. Sean Miller's father taught him the game of basketball and now Miller is teaching his boys this great game. Now you can get an inside look into how this basketball family passes on the essential skills and drills to the next generation. • Gregg Marshall shares sets that have given him a lot of success during his coaching career. In this on-court training video, Coach Marshall gives us a run down of 13 of his favorite quick hitting plays designed from the same Triangle Stack set. Teach Rebounding Skills '1-on-1 Drill' with Chris Mack! why Morgan Wootten is considered by many to be the greatest high school basketball teacher and coach of all time! and led his teams to more than 30 conference championships! • Coach Wootten uses high school players to demonstrate offensive and defensive team play necessary to develop a strong team at the junior high or high school level. Best of all, any of the offenses or defenses can be implemented easily . . . even when facing limited practice time! • Full-Court Offenses - His most effective full-court press breakers, fast breaks, and sideline inbound plays. He also demonstrates methods for being aggressive during press breaks and teaches an effective primary and secondary fast break. • Half-Court Offenses - All aspects of his half-court offense including man-to-man offense, zone offense, and half-court inbound plays. Also includes inbound plays from the sideline and under the basket which can create quick scoring opportunities against either man-to-man or zone defenses. • Half-Court Defenses - includes both aggressive and passive trapping defenses inside of the half-court line. Wootten's half-court zone defenses include the 2-2-1 trap, the 1-3-1 trap, and the 2-3. Included are half-court trap drills to teach players how to work together as a team and when and where to trap on the court. • Fundamental Drills and Games -(Disc 2) Basic drills and games to help coaches teach and reinforce individual and team offensive and defensive skills. Drills and games focus on dribbling, passing, shooting, defensive stance, and defensive shuffling. • Anyone who knows anything about college basketball understands the rich history and tradition of North Carolina basketball. Roy Williams grants you access to one of the most acclaimed basketball franchises in the history of the game. In this these two training videos, you get the opportunity to see how North Carolina and Coach Williams get ready for the upcoming season. • Roy Williams grants us access to one of the most acclaimed basketball franchises in the history of the game. In this second training videpo, we get the opportunity to see how North Carolina and Coach Williams get ready for the upcoming season through the practices during their first week. Given a pair of related measures ( X and Y ) on each of a set of items, the term "regression" is used to characterize the manner in which one of the measures (for example the Y measures) change as the other measure ( in this case, the X measure) changes. For any set of related measures, it is possible to specify a line that approximates the mean of the Y measures for those items with a given X measure. By revealing how the mean of the Y measures change as the various X measures change, this line is understood to describe the regression of Y on X. It is noteworthy that for the same set of related measures there is always a second regression line that describes the regression of X on Y. The regression line is the predicted value of Y for each value of X. Read More more details about this definition and another statistical terms at our new Statistics Terminology Encyclopedia. • Middle Tennessee State University Head Men's Basketball Coach Kermitt Davis has developed a well-balanced scoring offense. In this training videos, Coach Davis will show us how to push it early on offense for quick baskets versus man-to-man or zone defenses. • In ths training video we'll get the opportunity to watch as Coach Davis installs the ultimate 1-3-1 zone defense with a young team that is just learning the basics. We'll learn the rules to the offense and how it can be adjusted to cover talented shooters or to shift into a different defense mid-possession. John Kermit Davis, Jr. became head coach at Middle Tennessee in 2002. He led winning records in his first four seasons but first made a postseason tournament in 2010 at the CollegeInsider.com Tournament. Middle Tennessee followed that with appearances in the 2012 NIT and 2013 NCAA Tournament. Middle Tennessee moved from the Sun Belt Conference to Conference USA for the 2013–14 season. Following an appearance in the 2015 CollegeInsider.com Tournament, Middle Tennessee made the 2016 NCAA Tournament by way of winning the C-USA Tournament. In the first round of the NCAA Tournament as a #15 seed, Middle Tennessee upset #2 seed (and AP-ranked #2) Michigan State 90–81. Middle Tennessee then lost the second round game to #10 seed Syracuse 75-50. • In ths training video Coach Kermit Davis offers an inside look at how to structure competitive, high-intensity practices that promote teamwork and communication among players. We'll see the emphasis coaches place on building energy in the gym through demanding players to communicate and be engaged in every drill. • Kermit Davis shows you a strategy for skill development that is perfect for any high school coach. As a coach that knows how to win, Coach Davis demonstrates what it takes to develop highly skilled post and perimeter players. This revolutionary ideas combine basketball strategies with techniques learned in the martial arts. I call this system the “Better Balance Techniques. It doesn’t matter how big or strong or fast you are. If you know your center of balance and you use it to control your opponent’s balance, then you have a big advantage. Why would you play off-balance if you didn’t have to?. I think what I’m teaching can help shape the way people play the game. I want to transform the fundamental footwork of basketball with an array of offensive moves and defensive stances developed from martial arts-based principles of leverage. I envision doing this by teaching my concepts—and the offensive and defensive schemes specifically designed to employ them—to an NBA team and watching it win a championship with them. I do understand I’m asking for a lot. I grew up playing basketball in and around Mount Shasta, Calif. I was an all-star post player in high school and grew to be 6 feet 5 1/2 inches tall, and I played junior college ball at the College of the Siskiyous before a back injury prematurely ended my career. Along the way, I also had dabbled in the martial arts, including aikido, judo and karate, and I earned a brown belt in Kung Fu San Soo. I didn’t realize it at first that what I was doing was combining what I had learned in (martial arts training) and applying it to basketball. After I got hurt I couldn’t play, so I thought about the game all the time, and it just made so much more sense. The center of balance - knowing your center of gravity - was the key. The techniques help so much with post offense, post defense and rebounding. I did some voluntary and assistant coaching in California and Utah before moving to the Islands to be with my girlfriend, Lianna. I’d lived in Mililani the past three years and I am now trying to promote his idea to NBA coaching staffs. I'd talked with nine NBA teams and one WNBA team, but so far I havn’t been able to get past an introductory stage and all the way to the head coach. Every team has loved what I’ve shown them, but unfortunately I haven’t been able to see any head coaches yet. It boggles my mind. I would think that any coach who wants to win would be willing to see me for 10 minutes. I realize that the NBA has hundreds of people calling them, and they may think this is just another crazy person calling. (But) I think this (technique) definitely creates a chance to give their players an advantage. Even if it’s only a couple of rebounds a game, it’s worth it!. Basketball legend Bill Walton helped me in my journey. He watched and listened so intently, and said he agreed with everything I said, and then he wrote me a great letter of recommendation. It’s opened so many doors. “He has some valuable things to offer. I don’t know if all of it works, but there are some things you could use. Looking at how he connects with players, there’s something there. The problem is, you have to be a big-time coach to get your team to sign off on the expense of bringing a guy in for two weeks from Hawaii. And then there’s the time commitment. It’s just easier to say no. What he needs is the chance, once and for all, to succeed or fail.”, says finally former Sacramento Kings head coach Keith Smart. Read also this interesting story by Ric Bucher, NBA Senior Writer. Read more articles in Govinda Patterson on Facebook. Using on-the-court player demonstrations, Coach Pat Summitt shares the drills, philosophy, and techniques she has used in leading her teams to annually contend for the national title. Building a Championship Defense covers everything from person-to-person drills, and team defense to defending the low post and back screens to inbound denial. Coach Summitt also details the teaching responsibilities for each defensive position. Coach Pat Summitt is the former University of Tennessee head women's college basketball coach. During the course of her career coaching the Lady Vols from 1974 to 2012 she managed to lead the team to win eight NCAA championships. She holds the record for the most all-time wins for a coach in NCAA basketball history of either a men's or women's team in any division. Coach Summitt was the first NCAA coach, and one of four college coaches overall, to achieve 1,000 victories. Coach Summitt was named the Naismith Basketball Coach of the Century in April 2000. In 2009, the Sporting News placed her at number 11 on its list of the 50 Greatest Coaches of All Time in all sports; she was the only woman on the list. In 38 years as a coach, she never had a losing season. Go to this Basketball Training Course to read the full review, watch the full live footageand book the course! Coach Pat Summitt won more NCAA basketball games than any other coach in history, and in this video she breaks down the two on one segment of the fast break offense. Coach Summitt explains the coaching points of putting your opponent back on their heels and getting the ball to the basket in a hurry. • Offering open gym during the summer months is not enough to build your team for the upcoming season. Drew Hanlen, widely considered one of the best young skill development trainers in the game today, takes you through a detailed workout that will help advance your team's skill level. Coach Hanlen has worked with all levels of players, from youth to the NBA, and this video shows development drills used by both. Play three-on-three or four-on-four game called cutthroat which is hugely effective in teaching kids how to move. The rules are simple. 1) The game is best played with three or more teams of four (any leftover players can be rotated in at your discretion). To minimize confusion, each team should have its own practice jersey. 2) Every player on a team must touch the ball at least once before any shot can go up. 3) If a player catches the ball and fails to face the basket in triple threat position before dribbling or passing, it is a turnover. 4) If a player passes the ball, then fails to cut to the basket and fill to an open spot or go screen for a teammate, it´s also a turnover . 5) A player can dribble no more than three times - either to open up a passing lane or to attack the basket. 6) Only the coach is allowed to officiate. Points are automatically and instantly deducted any time a player protests a call. 7) One point is awarded for each basket made, one point for each offensive rebound, and one point for each steal (unforced turnovers don´t count!). At every change of possession (turnover and defensive rebound) and at every made basket, the ball is passed back to the coach. If there´s been a change of possession, the offensive team *sprints* off the floor and the defensive team goes to offense. The third team, waiting on the baseline, *sprints* onto the court and matches up on defense. The coach encourages this quick change over by passing the ball to the offensive team almost as soon as he receives it. After a made basket, however, it is the defensive team that vacates the floor. The offense stays on as long as they continue to score, which they can only do by passing and cutting and staying in motion. Un juego de tres-contra-tres o cuatro-contra-cuatro llamado 'cutthroat' (competencia extrema) el cual es muy efectivo para enseñar a los chicos como moverse. Las reglas son simples. 1) El juego es jugado mejor con tres os mas equipos de cuatro (cualquier número de jugadores adicionales pueden ser rotados a discreción del entrenador). Para minimizar la confusión, cada equipo debería tener su propio color de camiseta de práctica. 2) Cada jugador en un equipo debe tocar el balón por lo menos una vez antes de realizar un lanzamiento. 3) Si un jugador toca el balón y falla en atacar el aro en una posición de 'triple threat' -triple amenaza- antes de driblear o pasar, ésto es una pérdida del balón. 4) Sin un jugador pasa el balón, y entonces falla en cortar hacia el aro y abrirse para un lanzamiento abierto o en ir a cortinar a un compañero, ésto también es una pérdida de balón . 5) Un jugador puede botar el balón no más de tres veces - sea para abrirse hacia una línea de pase o para atacar al aro. 6) Solamente el entrenador dirige el juego. Puntos son automáticamente e instantáneamente reducidos cada vez que un jugador protesta un fallo. 7) Un punto es conferido por cada canasta convertida, un punto por cada rebote ofensivo, y un punto por cada recupero (pérdidas de balón no forzadas no cuentan!). En cada cambio de posesión (pérdida de balón y rebote defensivo) y en cada canasta convertida, el balón es devuelto al entrenador. Si ha habido un cambio de posesión, el equipo atacante *sprintea* fuera del campo y el equipo defensivo pasa a atacar. El tercer equipo, esperando sobre la línea debajo del otro aro, *sprintea* dentro del campo para defender. El entrenador debe alentar este cambio rápido pasando el balón al equipo en ataque tan pronto como lo recibe. Después de una canasta convertida, sin embargo, es el equipo en defensa el que deja el campo de juego. El atacante sigue en juego en tanto siga convirtiendo, lo cual podrán hacer solamente por medio de pasar, cortar y mantenerse en movimiento. • Andy Enfield, USC Head Coach and former Gulf Coast University Head Coach was the first 15 seed to ever make the Sweet Sixteen. See how you can learn his fast break offense and incorporate it into your own team! The two drills in this segment are both great ways to warm up at practice. • During all his career as Head Coach, Roy Rana led his team to the most victories in a single season by shutting down opponents in transition, stopping the pick & roll and by building fundamental individual defenders. In this training video He guides us through his philosophy and drills, which led to one of the best seasons in Ryerson University basketball history. • Coach Rana shows in this training video how your players can get shots up in transition from dribble penetration, drift shots, open 3-pointers and paint touches. The Ryerson Rams became one of Canada's best university basketball teams and Coach Roy Rana has been key in turning around Ryerson's men's basketball program. • Roy Rana, presents in this training video some sets and plays designed for special situations. From after timeout sets, to after free throw sets, to scoring off of an inbound play, Coach Rana has put together a package of plays that will allow you to score key buckets in special situations. 6 Basketball Training Videos ! To Learn from the Legends ! • Coach Knight opens the series with an analysis of his coaching style followed by a discussion on how to use your beliefs and ideas to develop your own coaching philosophy. He describes strategies that will help you adapt concepts used by other coaches to fit your team. • For coaches who spend more time practicing than teaching, Hall of Fame coach Bob Knight delivers drills in these traininig videos that will help coaches train their players to think, react and better understand the game. Learning to "think the game" can make average players into good players. Using on-court demonstrations, Coach Knight shares in these training videos warm-up drills that will make players think about what they're doing on the court. • This is the third training video in the clinic by the Hall of Fame Coaches Bob Knight. Advantage/Disadvantage Drills is a big part of how Coach Knight teaches his players to play basketball. Two of basketball's all-time coaching legends share their thoughts on the game, how it should be coached, and the some of the drills that have made their teams so successful. Coach Knight opens the series with an analysis of his coaching style followed by a discussion on how to use your beliefs and ideas to develop your own coaching philosophy. He describes strategies that will help you adapt concepts used by other coaches to fit your team. Knight discusses how to build a solid offense around getting to the free throw line and being able to use the concepts of pass, cut, and screen as your fundamental principles. He explains how small details such as the effective use of managers, filming practice, and practice time can contribute to the overall success of the program. Coach Auriemma follows with his own discussion on fundamental coaching philosophies. He emphasizes the importance of adjusting your team's playing style to fit the strengths and abilities of your athletes. He then talks about the way he begins practice and the kinds of drills he believes teams should be practicing. You will see offensive drills that create a culture of trust, hustle, and being fundamentally sound on the offensive end. Auriemma combines several basketball concepts into one comprehensive drill that will strengthen skills while maximizing practice time. He also provides simple but effective drills that teach players how pass, cut, and shoot within the offense. Finally, he shares several strategies he uses regularly to build his fast break. Improve your team and add value to your practices with these tips, drills and strategies from two undisputed coaching powerhouses. Your players will learn how to play within your offensive system based on what they do everyday in practice. At the end of the instruction, Coach Knight and Coach Auriemma share their wisdom, knowledge, and experience in a question-and-answer session. On topics ranging from calling timeouts to practice philosophy to communicating with players to breaking down film, Coaches Knight and Auriemma share the wisdom and insight they have learned in their illustrious careers as two of the most successful basketball coaches to ever lead the game. • A zone defense can take the most dominant offense and turn it upside-down. To beat a zone defense, Coach Knight utilizes two basic strategies-dribble penetration and beating the zone down floor. Using on-court demonstrations, he shows every attacking angle that can be used to attack the zone defense off of the dribble. By using this strategy, you will learn how to create offensive advantages. • One of the most important skills in basketball is shooting. In this instructional segment, Coach Knight shares insights into the art of shooting. He makes you think about how often your players shoot, whether they have a shooting routine, and in what ways they can improve their shooting techniques. • Using on-court demonstrations and drill work, Coach Knight covers 1-on-1 and 2-on-2 drills that can be used in practice to utilize the entire team and instill your defensive philosophy into your players. 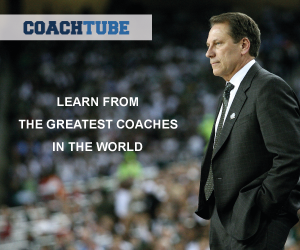 Coach Izzo discusses his philosophy on practice planning and shows you how he teaches his players in film sessions, and also about his practices devoted primarily to transition offense, man-to-man and zone offense, and installing a 2-3 match-up zone defense. . Sit in on a film session that shows the level of detail that a future Hall of Fame coach uses to analyze his team. Plays from the previous practice are displayed as Coach Izzo corrects flaws in ball and foot placement, player positioning, ball handler's line-of-sight, variations in speed and timing and situational recognition. Coach Martin uses position breakdown drills to brush up on defending ball screens with their "weak" pick and roll coverage. Defensively, Coach Martin places an emphasis on closeouts, which focus on containing the dribble while contesting a potential shot. Cuonzo LaMar Martin is an American basketball coach and former player who is the current head coach of the California Golden Bears men's basketball team. Coach Martin builds his transition offense by demonstrating his Through Action. The Bears run their secondary set in both a 5-on-0 setting and against a defense. This set features a cross screen for a post-up followed by a down screen (screen-the-screener action).